Episode 6×12 “All For Nothing” — Oliver (Stephen Amell) continues his battle with Cayden James (guest star Michael Emerson). Dinah (Juliana Harkavy) and Oliver have a major disagreement that endangers the life of one of their own. Mairzee Almas directed the episode written by Beth Schwartz & Oscar Balderrama. Air Date: Thursday, February 1 (9:00-10:00 p.m. ET) on the CW. 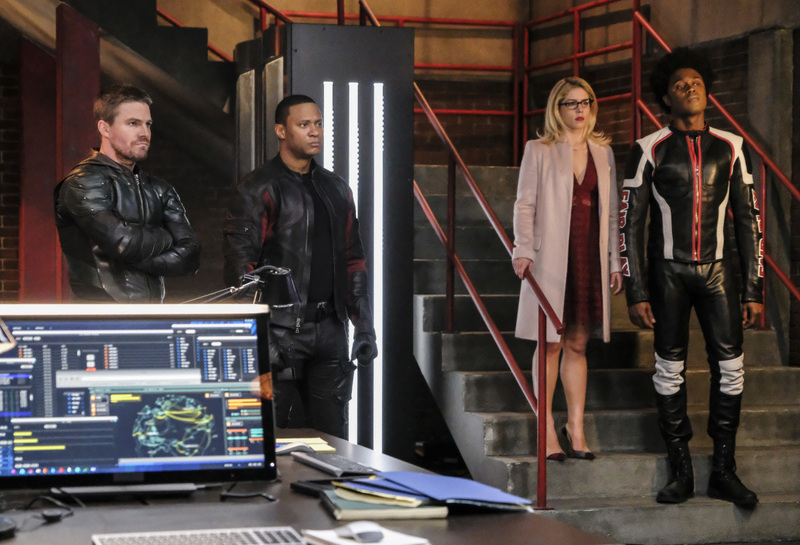 Arrow -- "All for Nothing" -- Image Number: AR612a_0035.jpg -- Pictured (L-R): Stephen Amell as Oliver Queen/Green Arrow, David Ramsey as John Diggle/Spartan, Emily Bett Rickards as Felicity and Echo Kellum as Curtis Holt/Mr. Terrific -- Photo: Bettina Strauss/The CW -- ÃÂ© 2018 The CW Network, LLC. All rights Reserved.